You have a cat. Cats have claws. Your cat needs to use those claws, and you’d rather they didn’t use them on you or the sofa. The solution is to get your cat a scratching post. To choose a good scratching post, you need to consider construction, material, and design. If the post doesn’t take the fundamental needs of a feline into consideration, your cat will ignore it, and find another way to sharpen their nails. To choose the best scratching post, you also need to consider your cat’s personality and scratching habits. The PETMAKER scratching post design consists of a sturdy, mid-height perch supported by three sisal-wrapped scratching legs. 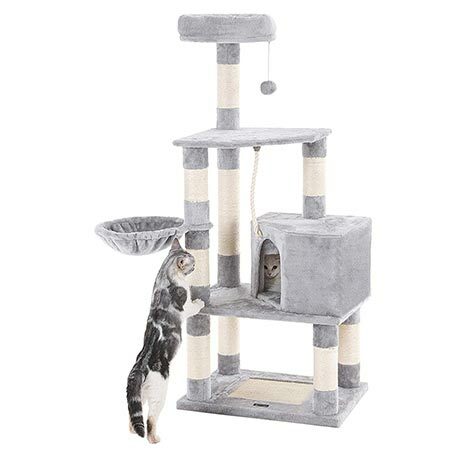 The upholstery on the top and the base offers a slightly softer scratching option, and three dangling toys attract your cat’s attention. Reviewers mention the surprising amount of variety this item brings to their cat’s playtime, and how well it is shared among multiple cats. Since the perch is at couch level, PETMAKER’s scratcher is a good choice for a living room or study room environment. When your cat jumps up, they’ll be at the perfect petting height. Sisal rope fiber is great for scratching. The three-leg design keeps the perch stable. The perch is not as tall as a proper cat tree. Cats who scratch horizontally will be unsatisfied. 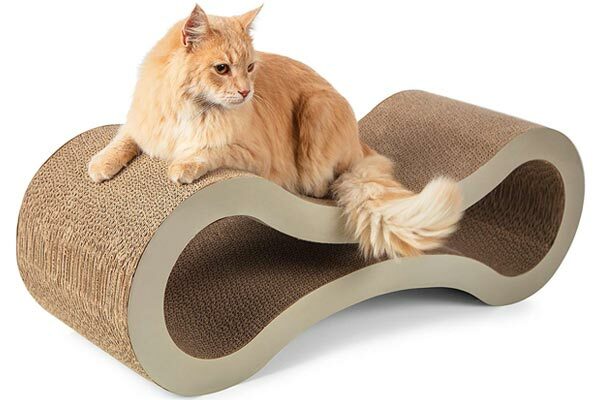 The Paws & Pals Lounge Post is a curvy cardboard construction that your cat will probably adore. The lounge is a sturdy figure-eight made of compressed cardboard, with a divot in the center for your cat to sprawl on. The non-toxic cardboard material is textured on the outside, and great for both scratching and chewing. Other, similar models exist on the market; but Paws & Pals offers a lower price and a friendlier construction. The lounge also comes in three colors: beige, blue, and grey. The cardboard material is safe to claw, chew, and destroy. The unique curved shape allows for different scratching positions. As it is made of cardboard, the lounge will eventually need to be replaced. The floor-level design may not appeal to cats who prefer heights and vertical scratching posts. 4Claws sells an entire line of scratching pads and posts, letting you pick the perfect match for your cat’s style of scratching. Among their offerings are a wall-mounted scratching post, an inclined scratching pad, and a scratching lounge. All of the products feature solid construction, a sleek, ergonomic design, and plenty of scratching surface. The Basics line uses cardboard for the scratching material but has been noted by reviewers to be durable and long lasting. These scratchers are all geared toward horizontal scratching and floor-level environments, meaning they pair well with a vertical pole or cat tree. They also make great choices for a living room scratcher to divert attention away from the sofa. Unique scratching bases appeal to the way your cat likes to stretch and move. Each scratcher is designed to fit into an existing environment, like the living room. Cats who like to chew or unwind sisal rope will be disappointed by the amount of cardboard. Many of the scratches aren’t as long as a cat needs for a full stretch. 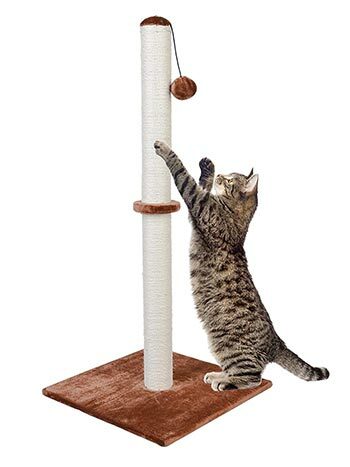 Dimaka’s Tall Ultimate scratcher stands at a full 37″, promising your cat the perfect vertical scratching stretch. The scratcher is advertised for big cats, and reviewers note that their largest pets have not toppled it during playtime. The post consists of a cardboard center wrapped in white sisal fiber, with a weighted base covered in soft plush. For decoration, a matching plush toy dangles from the top of the pole. The Tall Ultimate isn’t particularly extravagant, but that’s not the point. It’s tall, stable, and completely clawable; the kind of scratcher that will last your cat for a very long time. The post is tall enough for a large cat to use. The sturdy design is safe and long-lasting. A single pole will not appeal to horizontal-scratching cats. SONGMICS’ take on the cat tree is tall but sturdy, with a notably roomier condo than many trees on the market. But what really makes this item special is the sisal-covered scratching mat on the base of the tree. Every connecting pole is also wrapped in sisal twine, giving your kitty plenty of both horizontal and vertical places to scratch. The cat tree is full size, with two perches, a condo, and a hammock. It stands at 58″, a height which might be prone to toppling. To combat this, SONGMIC gave the tree a weighted base and anti-toppling fittings that attach to the wall for safety. Sisal fiber covers multiple locations, giving your cat a variety of scratching surfaces. Anti-toppling fittings ensure your cat’s safety. Cat trees give your cat their own space and keep them from damaging the furniture. Cat trees are large and require more space than a scratching post. Poles may need to be re-wrapped after a significant amount of scratching. What is a scratching post? A scratching post is a solid base covered in a textured material that your cat can dig their claws into. Scratching surfaces can come in a variety of shapes, ranging from the traditional post to an elaborate cat perch. 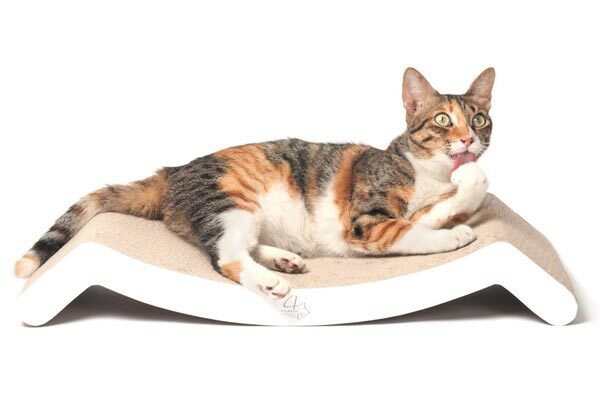 The important element isn’t how the scratcher looks, but how well it accommodates your cat’s need to scratch. New forms of scratcher are consistently being created, but they all share one thing in common: a rough, textured, fibrous surface for your cat to rake their claws through. Why does my cat need to scratch? 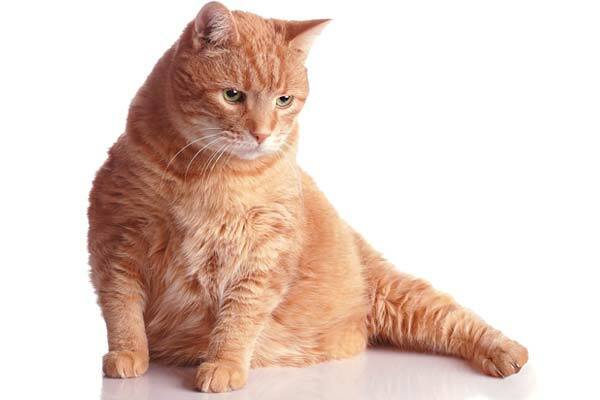 Scratching is necessary to maintain the health of your cat’s claws. According to an article by Julia Wilson, a cat’s claw is a unique appendage attached to the end of their toe. The center of the claw, known as the quick, contains blood and nerve endings and is extremely sensitive. Surrounding the quick is a hard sheath composed of keratin, similar to human nails. Cats need to shed the outer layer of their claw on a regular basis to make room for new growth. The easiest way to do this is to run the claw across a surface that will pull and catch on the dead sheath. In the wild, cats like to scratch on tree bark; in your home, they need a scratching post. A lack of a scratching surface can put your cat’s health at risk. Overgrown claws can get torn, develop infections, or even grow inward toward your cat’s paw. When left without a way to scratch, cats may end up clawing at furniture or biting their own nails. To your cat, a scratcher isn’t just for nail maintenance; it’s also a way to de-stress, stretch their muscles, and express dominance over their environment. Choosing a scratcher that your cat likes will help keep them relaxed, calm, and happy. 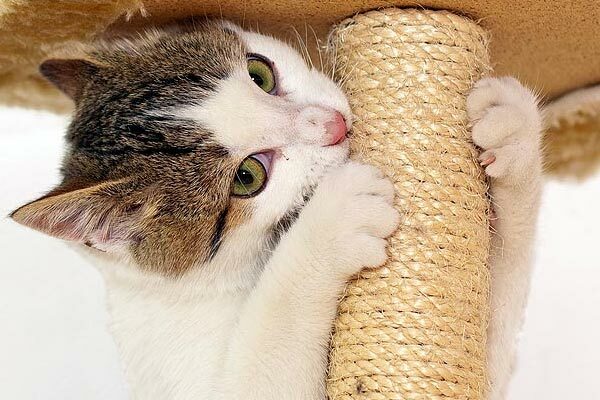 What makes a great cat scratcher? To your cat, a good scratching post is all about the texture. They need something rough that they can dig their nails into. Pam Johnson-Bennett warns against using cheap scratchers made with carpet-like material; the soft loops catch on their nails and can result in a stuck paw. Instead, many scratching surfaces are made out of sisal rope or cloth. The Encyclopedia Britannica lists sisal as a plant native to Central America; fibers from the leaves are used to make extremely durable and flexible rope and twine. The natural material is safe for your cat to chew on, and the rough fiber texture is perfect for raking claws through. An alternative material for scratching is ridged or corrugated cardboard. Depending on your cat’s preferences, the texture and sound of cardboard might be just the thing to dig their claws into. Like sisal, cardboard is fibrous, textured, and non-toxic. If your cat doesn’t seem to like sisal or cardboard, you can also try introducing them to regular wood. The hard material can be too much for many indoor cats, but some felines really prefer the feeling of bark under their paws. On an ideal post, your cat can fully extend their paws above their head, getting a full stretch as they claw downward. For your cat’s safety, make sure the post is sturdy and wobble-free. Johnson-Bennett notes that taller poles need a wider base to remain upright. Some larger posts and trees come with wall attachments, which should be used for additional stability. If the pole wobbles while your cat is using it, they won’t feel safe scratching there anymore and will look for other solutions. Some cats prefer to scratch horizontally rather than vertically. Dr. Marty Becker mentions that cats like to scratch in a variety of ways, including horizontal or even upside down. The goal is to relax and play as much as it is to maintain nail health. The perfect scratcher is a matter of taste; if your cat doesn’t like the first one, don’t hesitate to try a different style. Cats love scratching posts; a good scratching surface will be infinitely more appealing than any of the alternatives in your home. Make sure the scratcher is placed prominently in an area your cat likes to hang out in. If they feel comfortable with both the post and their environment, they should start clawing at it on their own time. If you have recently adopted a kitten, try introducing a scratcher into their environment as early as possible. Scratching is in their nature, and it shouldn’t be long before they start caring for their claws. However, once your cat has already learned to claw couches and drapes to satisfy their scratching needs, you will have to help them unlearn the behavior. The MSPCA recommends that you wait to teach your cat that the couch is off-limits until after they are using the new post you have provided. It’s important not to reinforce the idea of scratching as negative, so praise your cat for using the post. If they haven’t noticed it yet, you can try luring them in with a little catnip. If they refuse to use it, you may need to try a different style of the scratcher. If they still try to claw the couch, you can startle them with a loud noise or a gentle spray of water. Make sure your cat thinks the spray came from nowhere, so they associate it with the act of clawing at the couch, and not with you or with their scratching post. Jackson Galaxy, of My Cat from Hell fame, discusses a few methods you can use if your cat simply won’t stop scratching at the furniture. 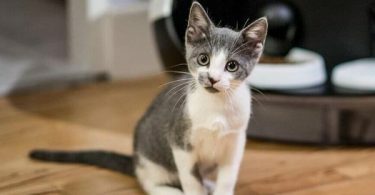 However, he emphasizes that with the right post to match their preferences and the right environment, your cat should naturally prefer the scratching post. Without one, you can’t even start to teach them to leave the furniture alone. In the above-mentioned video, Jackson specifically recommends the Scratch Lounge, a reversible and replaceable cardboard cat scratcher. If your cat enjoys destroying their scratcher as quickly as possible, a replaceable scratch pad might be the solution they need. Do I need more than one scratching post? Cats are territorial creatures and need their own space to feel dominant and secure. If you have multiple cats, they might be able to share a post; but as Johnson-Bennett notes, having multiple scratching surfaces will ease tensions and decrease the chance of conflict. Make sure the scratchers are spaced out around the house, so each cat can find the space they need to feel safe. Multiple types of scratching surfaces can also be a good idea for a single cat. 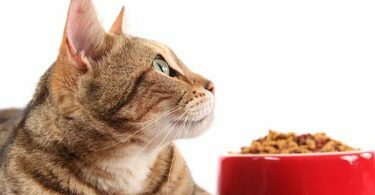 The variations in texture will help keep your cat from getting bored with their post and encourage them to stay fit and healthy. For example, many cat trees have a sisal rope base and satisfy your cat’s vertical scratching needs. To widen your cat’s experience, consider a horizontal cardboard scratcher, or a scratcher perch with a unique shape. Ultimately, the important thing is that your cat has somewhere to take care of their nails. Depending on the space available, this may mean a single, sturdy post, or a house-wide scratching setup. But as long as your feline doesn’t feel like his paws have been neglected, your furniture and your cat should both be perfectly fine.